This year, the anniversary came against the backdrop of remarks by President Donald Trump, who has already engaged in a war of words with Iran’s leadership and put Tehran “on notice” over its recent ballistic missile test. 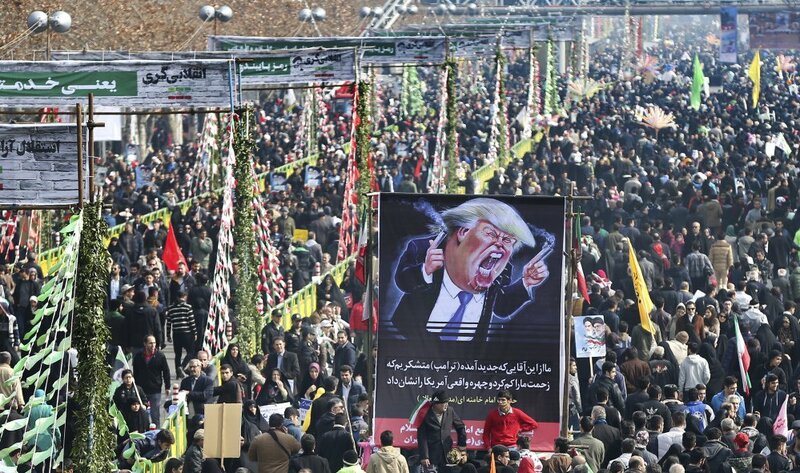 At the Tehran rallies Friday, demonstrators chanted traditional slogans against the United States and Israel, and later, hundreds of thousands marched toward the city’s central Azadi Square, where Rouhani addressed the crowds, telling them that Iran will strongly answer any threat from its enemies. “All of them should know that they must talk to the Iranian nation with respect and dignity,” Rouhani declared. Many of the marchers carried the Iranian flag, others had banners and posters with revolutionary slogans. Printed U.S. flags and pictures of current and former U.S. presidents lay scattered on the streets – so they could be trampled by the marchers. Iran and the U.S. have not had diplomatic relations since 1979, when Iranian students stormed the American Embassy and took 52 Americans hostage for 444 days.